Hundreds more refugees have drowned in the Mediterranean, the British government are refusing to even take parent-less children from Calais, and Syrian refugees are being forced back into the jaws of the war they have fled. The Convoy to Calais on 18 June will be a huge demonstration of solidarity with refugees from the people of this country. The major unions are in. The biggest social movements are in. The Muslim community is in. Are you? This is practical aid but it is also a huge moving protest at the way governments across the continent are failing refugees. This is the time to come together and say: stop the scapegoating, solidarity with the refugees. Organised by Stand up to Racism, People’s Assembly Against Austerity, Unite the Union, Communications Workers Union, TSSA, Stop the War Coalition,War on Want, Momentum & Muslim Association of Britain. Collect: we need material, and money. Collect in your workplace, union, community, place of worship or just among your friends. Every bit counts. Organise – The Convoy to Calais is being supported by a wide range of groups – including Leeds Coalition Against the War who recently raised about £600 for We Are Wakefield at their fantastic ‘Rock for Refugees’ gig on 14 May. 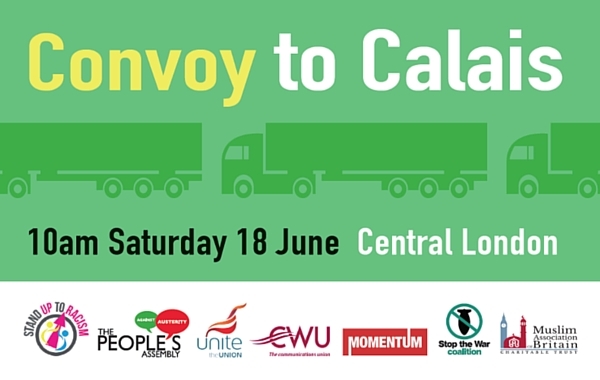 Leeds Coalition Against the War will be helping build for the Leeds Convoy to Calais as well – they meet every Wednesday at 7pm at Leeds Civic Hall – all welcome.